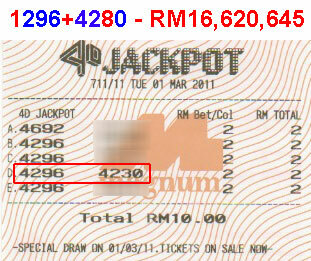 We almost win the RM16,620,645 on 1st March 2011. Our Magnum 4D Jackpot Pooling is a special group of members that share together to play the Malaysia game. Every week we drive in to Johor to buy over the counter a group of specially selected numbers. It is a long term investment and we are looking to win the big prize very soon. If you are interest to know more about this special pooling, call 92300837 now!